Today is day 2 of my top blog posts of 2014 countdown with Mia of PragmaticMom! This fun, mess-free art activity for little ones was my fourth most popular blog post with 21,180 views in 2014! We have done several variations on this activity, and I have blogged about a few of them. 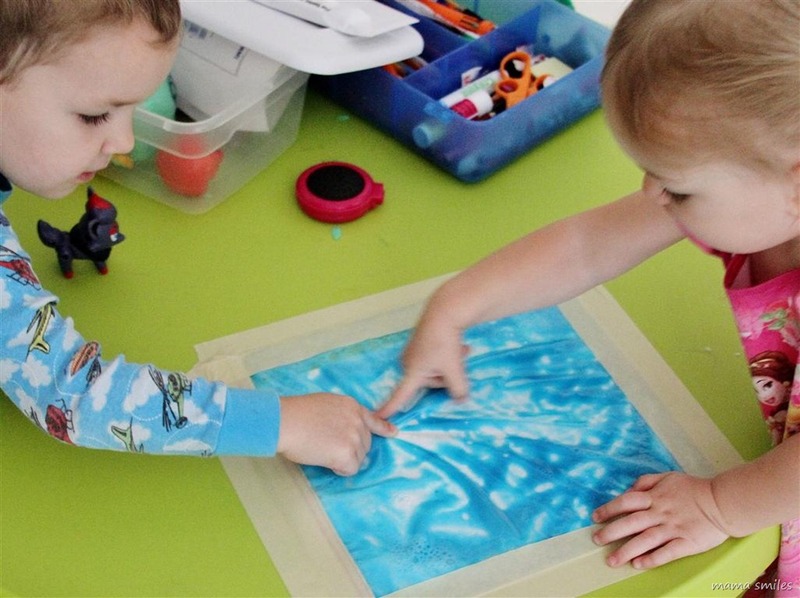 Mess-free finger painting with translucent hair gel was definitely a hit, as was mess-free color mixing and using this set-up to practice letter writing. I did discover that some types of washable paint seem to react with the plastic from the bag over time, so I actually recommend sticking with shampoos, gels, lotions or conditioners mixed with food coloring unless you have tested the paint. We usually add food coloring, but some shampoos and gels come colored already. You can even fill the bag with play dough for a higher resistance sensory activity! If you have a child who is likely to rip through the bag, I recommend coating the bag with packing tape before handing it over – that makes it a lot tougher. You can find more low-mess and mess-free activities for little ones by searching by my toddler activity tag, and on my toddler activities Pinterest board! Follow MamaSmiles’s board Toddler Activities on Pinterest.Mia’s #4 most popular post for 2014 is Top 10: Best Beginning Chapter Book Series (ages 6-9) with 14,206 views. I use Mia’s book suggestions a lot when I am looking for library books for my kids. She has an entire Pinterest board dedicated to early chapter books for kids! Mia’s #5 Post of 2014 is here. Mine is here. Mia’s #4 Post of 2014 is here. Mine is here. Mia’s #3 Post of 2014 is here. Mine is here. Mia’s #2 post of 2014 is here. Mine is here. Mia’s #1 post of 2014 is here. Mine is here. Do you have a favorite mess-free activity for kids that my toddler would enjoy? 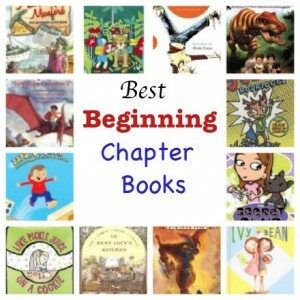 How about a beginning chapter book that you recommend for my first grader son or kindergartener daughter? If you are a blogger, I would love to hear which post was your fourth most popular in 2014! How fun! I just discovered this thing called Kinetic Sand which is sand but also like play dough. So you get the sand texture but it’s not as grainy and tends to stick together a lot more. My son had a blast with that! Kinetic sand is great! My kids are pretty into it too right now. I’ve been meaning to comment for a while after discovering your blog but was delayed with the birth of our third. Thank you for sharing all your knowledge and experiences. Looking forward to joining you on your journey and researching the archives. A great beginning chapter book series which was recommended to us by a friend which my kindergarten daughter (and 3 yr old son) has enjoyed is Houndsley & Catina. I’ve only been blogging for a very short while so I haven’t racked up enough posts to have a “fourth” most popular but this one has seen a lot of traffic: http://junemee.com/create/felt-food-breakfast. You have some great suggestions here – thanks for reminding me of beads and pipe cleaners – I haven’t done that with my youngest yet! I should also look for the Houndsley and Catina chapter book series. Thank you for taking the time to comment, and congratulations on the arrival of baby #3! Yay for mess-free!! That’s a great photo, too. My fourth most popular post this past year is the one with my kids’ portraits that I took for their Grandma: Christmas portraits five by five. Thank you! I LOVE those portraits you took of your kids!! That post has some very fun activities! My kids always found that to be fun as well back then. I should try giving some bags like that to my SIL who has a 2 year old right now. I need to make one for Anna – we haven’t done this since we moved to California! It must be hard to take down this great art project once you set it up; your kids must love it and never want it removed! I really appreciate how you did a round 2 of improvements to an already great idea! It does stay up for quite a while, every time we do it!